This is the ham that started it all for Dakin Farm. 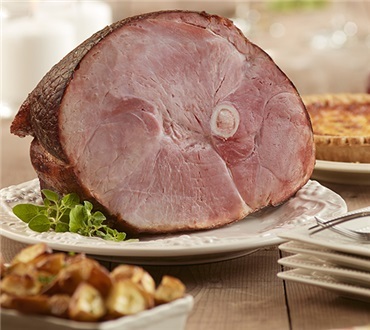 Maple-cured and cob-smoked, this ham will turn any dinner into a special occasion. It makes the perfect centerpiece- tender and sweet, moist and delicious. The classic choice for luscious flavor and plenty of leftovers, plus the flavorful bone makes a hearty soup. Fully cooked, just warm and serve. Because it is pre-cooked we cut this ham into several large portions freezing the bone with meat on it for soup at another time; large chunks for a dinner another time. After "roasting/warming" we found it be very salty in taste. Re-heating the leftover for another meal tended to cut down on the saltiness. But overall pleased with this ham -- it was not covered in a large layer of fat like most hams are and nice and lean vs. a large vein of fat through the center. Hands down the best ham ever. Basically I can not stop eating it. So delicious that you get a hint of Cobb smoke and with each bite you get a burst of juicy flavor.